Ninety years ago, Millie Sullivan's great-grandmother was a guest at oil tycoon Howard Dawkins' palatial estate on the shore of St. Simons Island, Georgia. Now, Millie plays a 1920s-era guest during tours of the same manor. But when her grandmother suggests that there is a lost diary containing the location of a hidden treasure on the estate, along with the true identity of Millie's great-grandfather, Millie sets out to find the truth of her heritage--and the fortune that might be hers. When security guard Ben Thornton discovers her snooping in the estate's private library, he threatens to have her fired. But her story seems almost too ludicrous to be fiction, and her offer to split the treasure is too tempting to pass up . 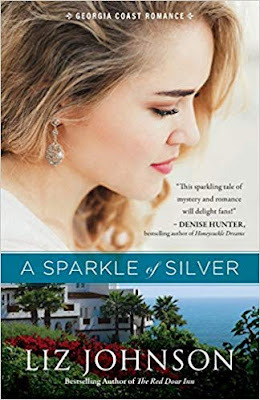 . .
A Sparkle of Silver is the beginning of the Georgia Coast Romance series, as well as, my first introduction to Liz Johnson and her writing. I thought this story was pretty good. I loved loved loved the beautiful setting of St Simons Island, Georgia. Millie is a likeable character. The mystery that she gets involved with kept me intrigued and fascinated until the end. I give A Sparkle of Silver four and a half stars. I can not wait to read more by Liz Johnson in the future, as well as, the upcoming releases from the Georgia Coast Romance series. I recommend this one.